Everyone knows that there are a lot of indie brands out there at the moment and it's really hard to keep up with all the new brands. 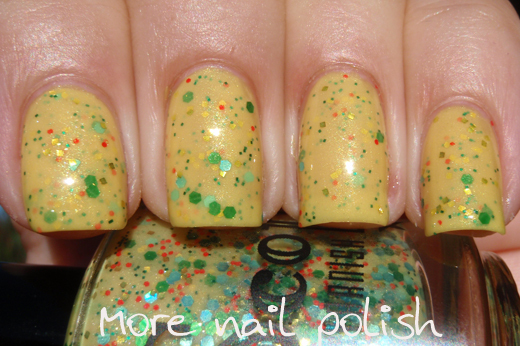 I often feel like I've been under a rock when I discover a new-to-me brand and realise that it's actually quite well established and already has lots of people buying and loving their polishes. 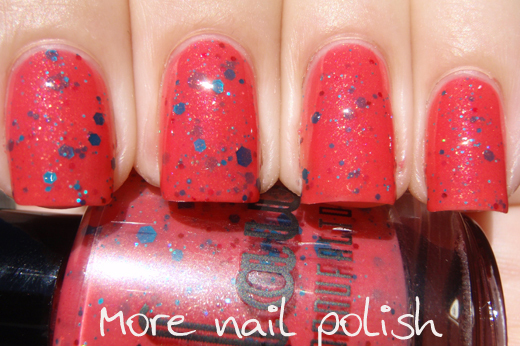 That's exactly how I felt when I received this collection of Scofflaw Nail Varnish in the mail. 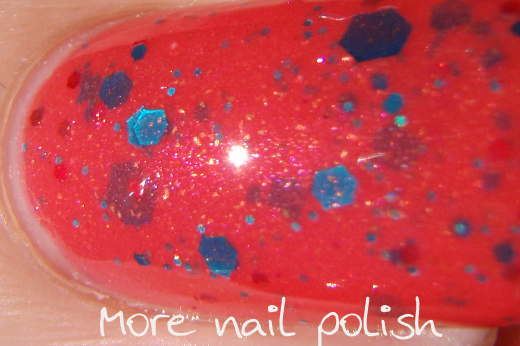 I received ten polishes, so I'll show you five today and five tomorrow. I think you're all going to really like these! Cloud Cuckoo Land - This one is a soft pale lavender jelly base that contains dark purple, copper, garnet, white, and lavender glitters. This could be worn layered over any pastel shade, but it's also buildable on it's own. I have three layers on here with a single layer of Seche Vite. 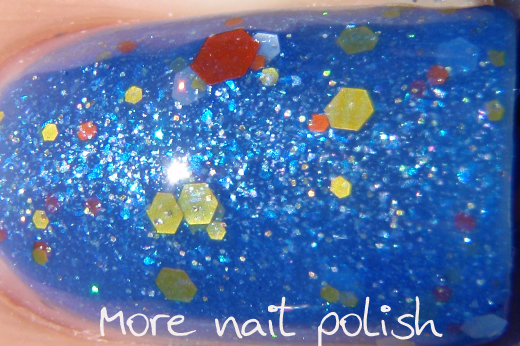 Application was excellent, especially for a sheer jelly polish like this. 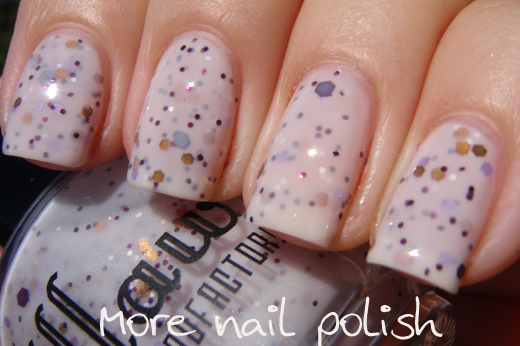 Think of the OPI ballets and you will get the idea of the gorgeous base on this. 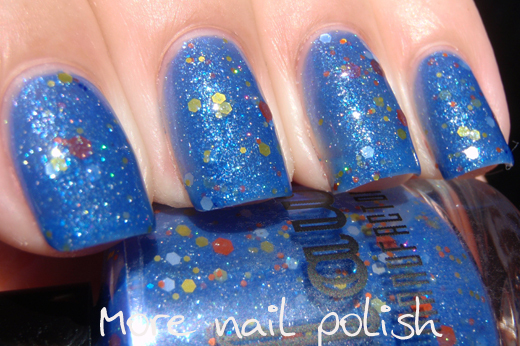 All the glitters lay beautifully smooth with no taco curling - which in fact is common across all these Scofflaw polishes. David Bowies Bulge - the polish name is a reference to the movie Labyrinth, if you just google the polish name you see why. The polish appearance is inspired to the Aladdin Same album cover - google that one too and you will see the resemblance. 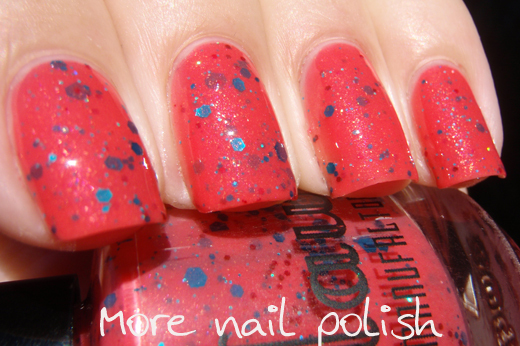 The polish is a deep coral colour with a shimmery finish. 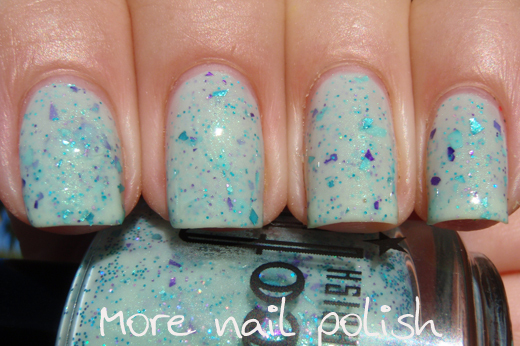 There are matte and holo teal glitter in various sizes, small dark red glitters and a bronze microglitter. 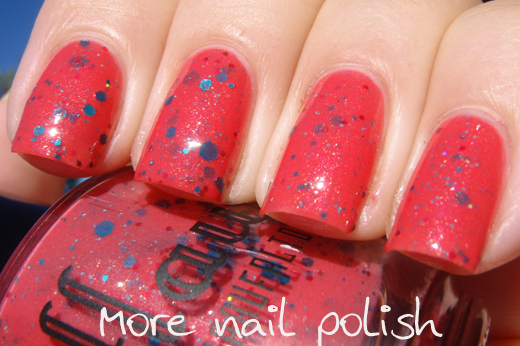 I wore three thin coats with Seche Vite on top. 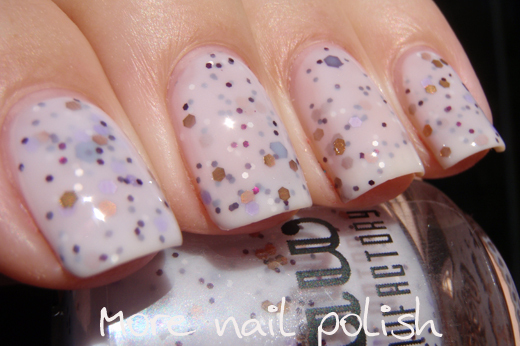 Beautifully smooth with no problem glitters. 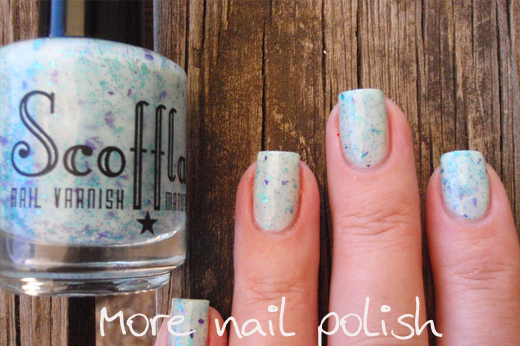 Flotsam and Jetsam - this one is a very pale teal blue jelly base with turquoise and purple micro glitters that provide a shimmery base. 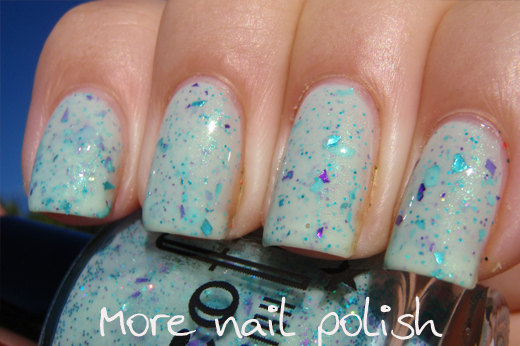 Its also strewn with shards of purple and teal, and I'm guessing it's these shards that give the polish it's name. In cause you're not up on your maritime law, here is a quick explanation of Flotsam and Jetsam. Jetsam is part of a ship, its equipment, or its cargo that is purposefully cast overboard or jettisoned to lighten the load in time of distress and that sinks or is washed ashore. Obviously this can be worn over any other pale shade, but again I chose to see what it would look like all on it's own - cause I love indie shades that don't have to be layered. 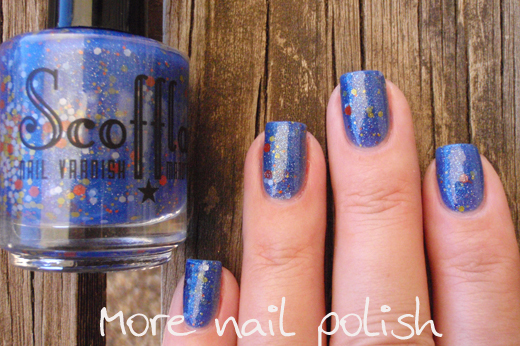 This is three thin coats with Seche Vite. Koi Pondering - The instant I saw this one, I was in love with it. The colour combinations of the white, orange and yellow glitters floating in the shimmery blue base truly does conjure up images of little fish swimming in a sparkling blue koi pond. 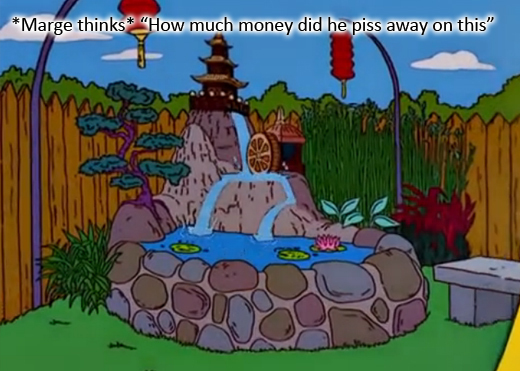 The other image that comes into my head with this polish is this quote from Marge Simpson about the koi pond Homer bought her. Which is funny, cause I'm sure my husband thinks the exact same thing every time more nail mail arrives. Anyway - here is this stunner! 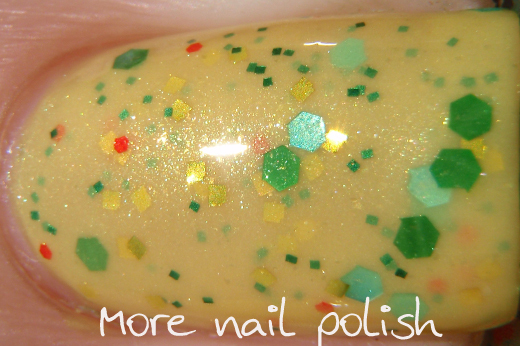 Insert Lemon Pun Here - This polish has a bright yellow base and contains gold, holographic light blue, emerald green, and bright orange glitters of various sizes. There is also a fine gold micro-shimmer that you can see in the marco shot. 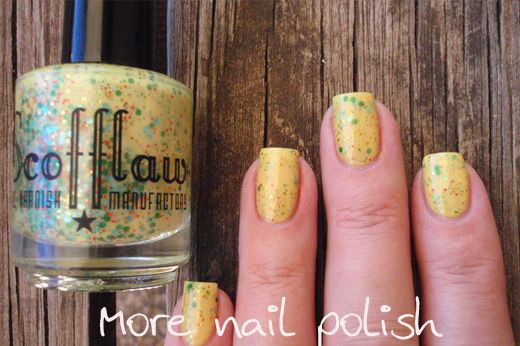 Fantastic formula for a yellow polish, which are normally pretty patchy. 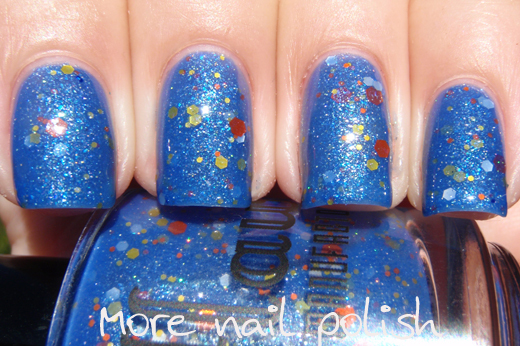 This was three thin coats with Seche Vite. 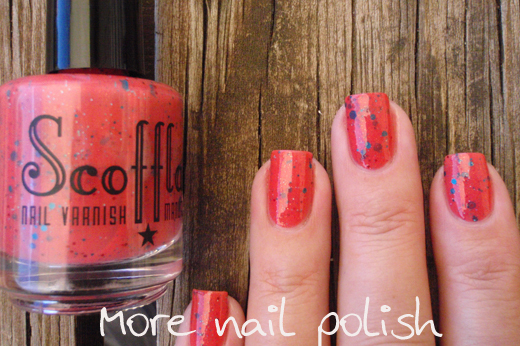 Scofflaw nail varnishes have recently started being sold through Llarowe for $11USD. They are in stock now. Don't forget to come back tomorrow for another five Scofflaw shades. Flotsam & Jetsam = Beautiful!! Great. Just when I thought I could skip these! Damn you and your impeccable swatching! ... and now I have drool all over my keyboard! These are really pretty! I LOVE Flotsam and Jetsam. I also really like Cloud Cuckoo Land. I love Flotsam and Jetsam! and that Koi Pondering one! it really looks like a pond with fish swimming in it.. so cool! Hi Cathy, just another bit of nerd trivia - Flotsam & Jetsam were also the eels that worked for Ursula in the Little Mermaid animated movie and they were a grey/purple sort of colour, so maybe a reference? 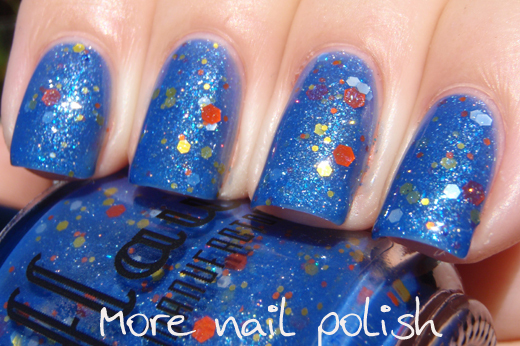 Very cool polish and as usual, your swatches are amazing! Beautiful!! Thanks so much for the shout out!